Tn5 is a transposase protein responsible for genomic rearrangements including deletions, insertions, and inversions in organisms such as Escherichia coli (E. coli). Hyperactive Tn5 is a modified version of the wild type Tn5 isolated from E. coli . The hyperactive version contains the mutations E54K and L372P, which improve the activity of Tn5 . This protein forms a dimer and is able to pick up specific DNA (transposon) flanked by the so-called mosaic ends (ME) sequence (CTGTCTCTTATACACATCT) and integrate it randomly into DNA. 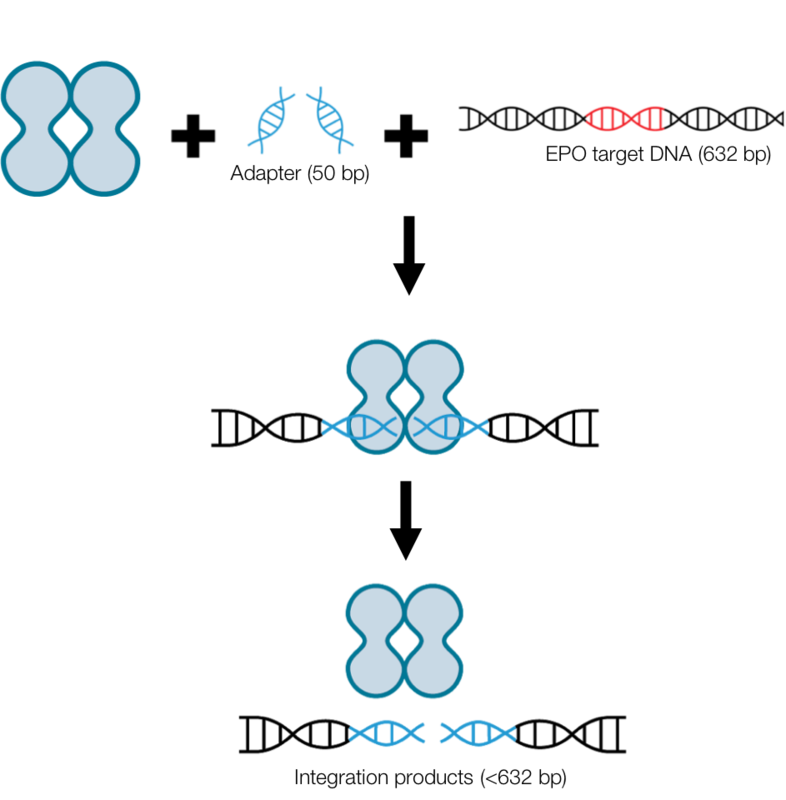 Two different integration reactions can occur depending on the configuration of the transposon that it picks up. The transposon flanked by ME sequences will induce an insertion event to the target DNA, extending the target DNA size by the length of the transposon. A transposon with a ME present on only one site (which will be described extensively in this documentation) will induce a double stranded break to the target DNA, creating two product molecules each with a transposon sequence on one site. BBa_K2643002 contains the gene of a Tn5 hyperactive mutant protein. Hyperactive Tn5 can be used in vitro to catalyse integration of DNA to other random DNA. Various rapid kits of different next generation sequencing platforms incorporate this transposase for sample preparation. It is utilized to randomly integrate DNA adapters (specific for different sequencing platforms) into the substrate DNA to allow the latter to be sequenced. BBa_K2643002 is a basic part for the dxCas9-Tn5 fusion protein (BBa_K2643000) that is used in vitro for targeted integration and eventually for targeted next generation sequencing. The functionality of this part is fully characterized by means of electrophoretic mobility shift (binding) assay (EMSA) and integration assays described further below. Moreover, the random activity of this Tn5 is also compared to the targeted activity of the dxCas9-Tn5 fusion protein that we constructed. In order to fully characterize the Tn5 biobrick, it had to be constructed, expressed, purified and tested for its in vitro functionality. The Tn5 coding sequence was cloned into the pACYCDuet-1 with a T7 promoter and a N-terminal HIS-tag in E. coli DH5α resulting in pACYCDuet-1_Tn5. This plasmid (pACYCDuet-1_Tn5) was isolated and transformed into E. coli BL21 AI for protein expression. The Tn5 protein was purified using both nickel affinity chromatography and heparin chromatography. Finally, the in vitro functionality of Tn5 was tested by developing and utilizing a EMSA and integration assay that checks for proper adapter loading of the Tn5 and validates integration activity. Construct two plasmids harbouring Tn5 coding sequence: in pACYCDuet-1 for expression and in pSB1C3 for iGEM biobrick submission. The construction of pACYCDuet-1_Tn5 was performed by restriction ligation cloning of Tn5 into the expression vector pACYCDuet-1 under the T7 promoter and terminator. Plasmid #60240 from Addgene, pTXB1-Tn5  was used as template for Tn5 amplification. Forward primer (5’-tataGAATTCtatgattaccagtgcactgcatc-3’) and reverse primer (5’-tataGGTACCttagattttaatgccctgcgcca-3’) were used for PCR amplification of Tn5 from the template pTXB1-Tn5. The primers include 5’ overhangs containing the EcoRI and KpnI restriction enzyme sites in the forward and reverse primer respectively. pACYCDuet-1 (Novagen) is designed for coexpression of two genes. The plasmid contains two multiple cloning sites (MCS), each of which is preceded by a T7 promoter/lac operator and ribosome binding site (rbs). The P15A replicon is present to sustain plasmid replication and the chloramphenicol resistance gene allows the use of selective pressure to maintain the plasmid in the cells. The vector pACYCDuet-1 was isolated from the E. coli DH5α cells according to the plasmid isolation protocol. Then, the Tn5 PCR amplicon and the pACYCDuet-1 plasmid were restricted with enzymes EcoRI-HF and KpnI-HF (New England Biolabs), according to the restriction protocol. The pACYCDuet-1 vector and Tn5 insert were ligated using T4 DNA ligase and the ligated product was transformed into chemical competent E. coli DH5α cells using the chemical competent cell transformation protocol. To note that by using the combination of EcoRI-HF and KpnI-HF restriction enzymes, one of the T7 promoters is excised, which is not a problem in this case. Transformed cells were screened via colony PCR using forward primer T7 promoter (5’-taatacgactcactataggg-3’) and reverse primer T7 terminator (5’-gctagttattgctcagcgg-3’) that amplify the sequence between the promoter and terminator. This way, fragments cloned into the multiple cloning site (located between the T7 promoter and terminator) of pACYCDuet-1 will be amplified. Additionally, the transformed cells were screened for presence of the Tn5 coding sequence using forward primer Tn5 (5’-tataGAATTCtatgattaccagtgcactgcatc-3’) and reverse primer (5’-tataGGTACCttagattttaatgccctgcgcca-3’). The colony PCR identified six positive colonies with possibly correct integration of Tn5 in pACYCDuet-1 (Figure 1). Figure 1. 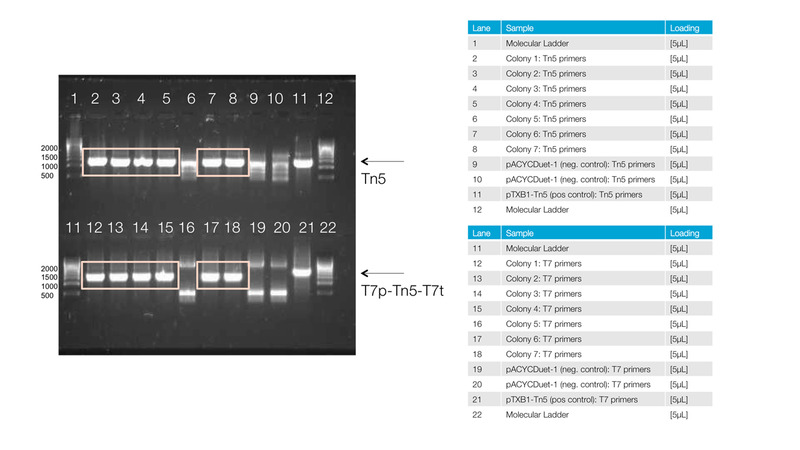 Colony PCR of Tn5 and T7p-Tn5-T7t. Expected sizes are respectively 1543 bp (Tn5) and 1685 bp (T7p-Tn5-T7t) . The ladder represents the size of DNA in bps. All positive colonies were grown overnight in liquid media supplemented with chloramphenicol. After plasmid isolation, one of the clones was sent for sequencing and insertion of the Tn5 sequence was verified. Glycerol stocks of the cells harbouring the pACYCDuet-1_Tn5 plasmid were stored at -80 ºC and plasmid was used for further characterization of the Tn5. The cloning of Tn5 in the iGEM compatible pSB1C3 BioBrick backbone was performed by restriction ligation cloning of Tn5 into the iGEM backbone. Plasmid BBa_J04450 from the iGEM registry was used as template for obtaining the pSB1C3 iGEM BioBrick backbone. This BioBrick contains mRFP expression cassette, which gives a red color to the cells harbouring the plasmid. First, BBa_J04450 was transformed into E. coli DH5α cells according to the chemical transformation protocol. The red colonies were inoculated in LB medium supplemented with chloramphenicol and the plasmid was isolated. The already present restriction sites SpeI & PstI and EcoRI & XbaI were used for cloning purposes of Tn5 into pSB1C3. The plasmid pACYCDuet-1_Tn5 was used as template to amplify the Tn5 coding sequence by PCR using forward primer (5’-GCTAAGGATGATTTCTGGAATTCGCGGCCGCTTCTAGatgattaccagtgcactgcatc-3’) and reverse primer (5’-CCTTTTTTGCCGGACTGCAGCGGCCGCTACTAGTAttagattttaatgccctgcgccatc-3’). The primers include 5’ overhangs containing respectively the suffix with restriction enzyme sites SpeI & PstI and prefix with restriction enzyme sites EcoRI & XbaI. These restriction sites flank the Tn5 and were used for cloning purposes of Tn5 into the pSB1C3 iGEM Biobrick backbone. According to the restriction protocol, the BBa_J04450 plasmid and the Tn5 amplicon were restricted with enzymes EcoRI-HF and PstI (New England Biolabs). The obtained pSB1C3 backbone and Tn5 insert were ligated using T4 DNA ligase. Subsequently, the ligated product was transformed into chemical competent E. coli DH5α cells using the chemical competent cell transformation protocol. The transformation resulted in red and white colonies. It was assumed that the red colonies still contained the initially present mRFP expression cassette. However, the white colonies potentially switched the mRFP expression cassette for the Tn5 coding sequence. Nine white colored transformed cells were screened via colony PCR using forward primer VF2 (5’-tgccacctgacgtctaagaa-3’) and reverse primer VR (5’-attaccgcctttgagtgagc-3’). These primers amplify the DNA from upstream of the prefix until downstream of the suffix. This way, any fragment cloned between the prefix and suffix would be amplified. Additionally, a negative control, which is the parental plasmid BBa_J04450, was also included in the colony PCR reaction. The colony PCR resulted in 9 possible colonies with correct integration of Tn5 in pSB1C3 (figure 2). Figure 2. Colony PCR of Tn5, expected size: 1743bp. 0.8% Agarose. The ladder represents the size of DNA in bps. Two of the positive colonies were grown overnight in liquid media supplemented with chloramphenicol. After plasmid isolation, the purified DNA was sequence verified. For sequence verification primer VF2 (5’-tgccacctgacgtctaagaa-3’) and VR (5’-attaccgcctttgagtgagc-3’) were used. Glycerol stocks of the cells harbouring the pSB1C3_Tn5 plasmid were stored at -80 ºC and the plasmid was sent to the iGEM registry. 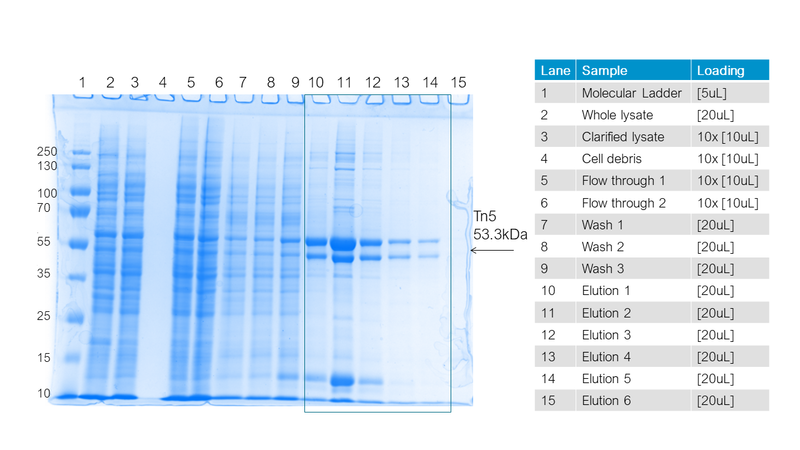 Transform the plasmid into the expression host (E. coli BL21 AI) and express the Tn5 protein. The Tn5 was expressed according to the protein expression protocol on our wiki. To summarize, LB media was inoculated with an overnight culture at OD600 ~0.02 and grown to OD600 ~0.5 in 5L shake flasks at 37 °C and 180 rpm. At this point, the cells were placed on ice for 30 min and induced with 1mM IPTG and 0.2% arabinose. Then, the cells were incubated for 16 hours at 18 °C and 180 rpm, for production of the Tn5. After expression, the cells were harvested and washed with PBS using centrifugation at 5200 xg for 15 minutes and 4 °C. The protein cell content was visualized on a 12% SDS PAGE to analyze the expression of Tn5. 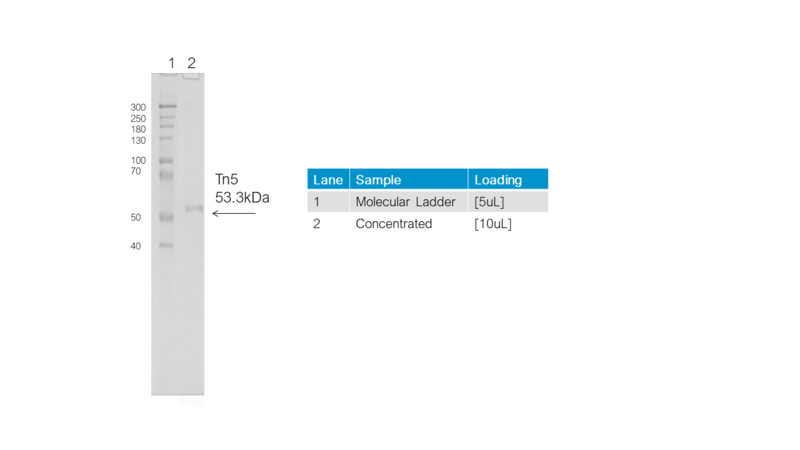 A significant amount of Tn5 protein (53.3 kDa) was observed in the crude and clarified lysate (figure 3, lane 3-4), which is not present in the pre-induced sample (figure 3, lane 2). This suggest that there is no leaky expression and that cultivation went according to our plan. Figure 3. 12% Tris-Glycine SDS PAGE of the expression of Tn5. The ladder represents the molecular weight in kDa. Purify the Tn5 from the cells that were received from upstream processing to allow functionality testing using pure Tn5 protein. Table 1. Nickel affinity Chromatography protocol. All fractions were analysed by SDS-PAGE, and fractions containing the Tn5 protein were pooled and further purified using heparin chromatography on the AKTA pure with a 1mL HiTrap Heparin HP column. 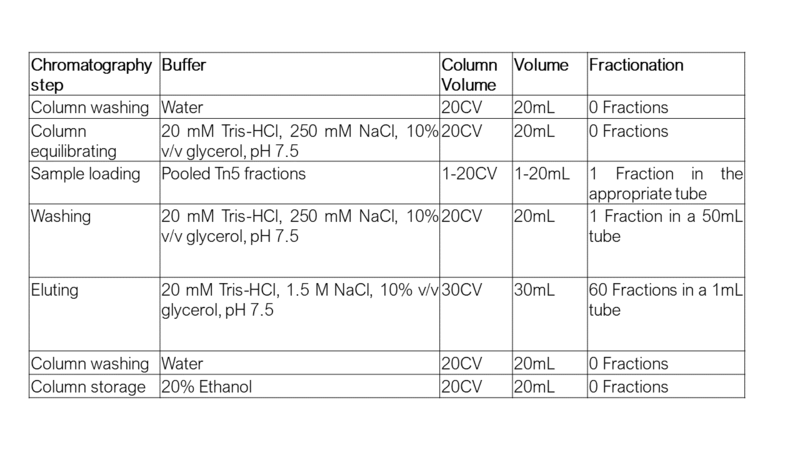 The applied chromatography steps are described in table 2. Table 2. Heparin Chromatography protocol. All fractions were analysed by SDS-PAGE and fractions containing the Tn5 protein were pooled and dialysed twice against 1L of dialysis buffer (20 mM Tris-HCl, 100 mM KCl, 5% v/v glycerol, 1 mM beta-mercaptoethanol and pH 8) for one hour using a Pierce 10 kDa molecular weight cut-off cassette. After dialysis, the Tn5 protein was concentrated 6x with an Amicon Ultra-15 with a 10kDa molecular weight cut-off and subsequently frozen at -20℃ and stored for functionality testing assays. 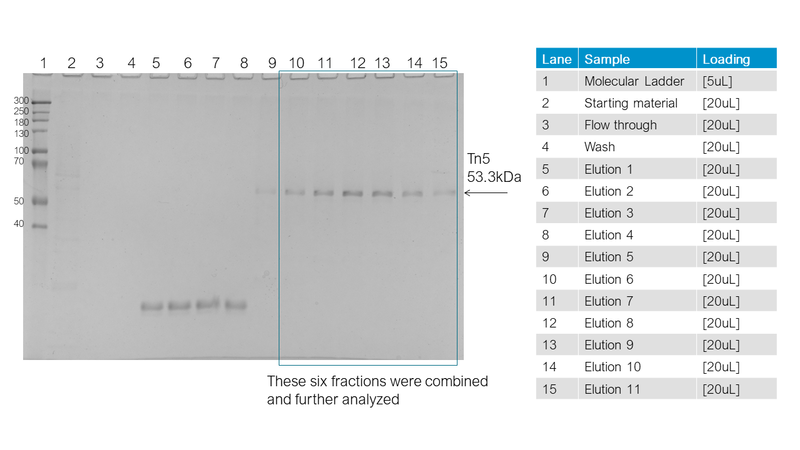 A significant amount of Tn5 was observed in the nickel chromatography elution fractions (figure 4, lane 10-14), however the Tn5 protein was also observed in the flowthrough and wash elution fractions (figure 4, lane 5-9). It is recommended to optimize the nickel chromatography to reduce these losses. For our purposes, the Tn5 losses were tolerated because the amounts that we obtained were sufficient to proceed to functionality testing of the Tn5. To increase the Tn5 amount, the first five elution fractions were pooled (figure 4, lane 10-14). Figure 4. 12% Tris-Glycine SDS PAGE of the nickel chromatography of Tn5. The ladder represents the molecular weight in kDa. No losses were observed in the flowthrough or wash (figure 5, lane 3-4) of the heparin chromatography run, resulting in high recoveries. The first 4 elution fractions (figure 5, lane 5-8) contained some low molecular weight contaminating proteins and therefore only elution fraction 6 to 11 (figure 5, lane 10 to 15) were pooled. Figure 5. 20% Tris-Glycine SDS PAGE of heparin chromatography of Tn5. The ladder represents the molecular weight in kDa. After dialysis, the sample containing the Tn5 protein was run on a 12% SDS PAGE gel for protein content visualization (figure 6). The background proteins were almost absent, indicating satisfactory Tn5 purity. The final protein concentration of the solution was determined according to the BCA protocol and resulted in a concentration of 0.46mg/mL (8.64µM) Tn5 protein. Figure 6. 12% Tris-Glycine SDS PAGE of the final Tn5 post concentration. The ladder represents the molecular weight in kDa. The aim of this experimental section is to confirm the ability of Tn5 to load the adapter DNA containing the mosaic end (ME) sequences. When the adapter is loaded on Tn5, a mobility shift of the Tn5-adapter complex can be observed on a 8% TBE Native PAGE. The in vitro functionality was tested according to the Tn5 electrophoretic mobility shift (binding) protocol] on our wiki. To summarize this method, we incubated 2.5µM adapter with 0 - 6µM Tn5 in a Tris-HCl based buffer for 1 hour at 23ºC to test the loading of adapter DNA to Tn5. The reaction was loaded on 8% TBE Native PAGE to visualize the EMSA ;. A mobility shift of the adapter DNA was observed (figure 7, lane 4-8). This indicated the ability of the Tn5 to pick up the adapter DNA. This complex retards the movement of the DNA through the polyacrylamide gel, creating the two distinct bands indicated by the arrows. The lower bands around the 50 bp mark represent the unloaded adapter DNA (figure 7, lane 3-10) and the higher bands visualise the adapters loaded by the Tn5 (figure 7, lane 4-8). The absence of the upper band on lane 9 indicates the denaturation of the complex by SDS. Lastly, the absence of the upper band on the negative controls where either the adapter (figure 7, lane 10 and 11) or the Tn5 (figure 7, lane 2 and 3) was omitted confirms that the observed mobility shift on the other lanes are due to the adapter loading on the Tn5. Figure 7. Adapter DNA mobility shift when adapter DNA is loaded on Tn5 as observed on 8% TBE native PAGE stained with ethidium bromide. The ladder represents the size of DNA in bps. 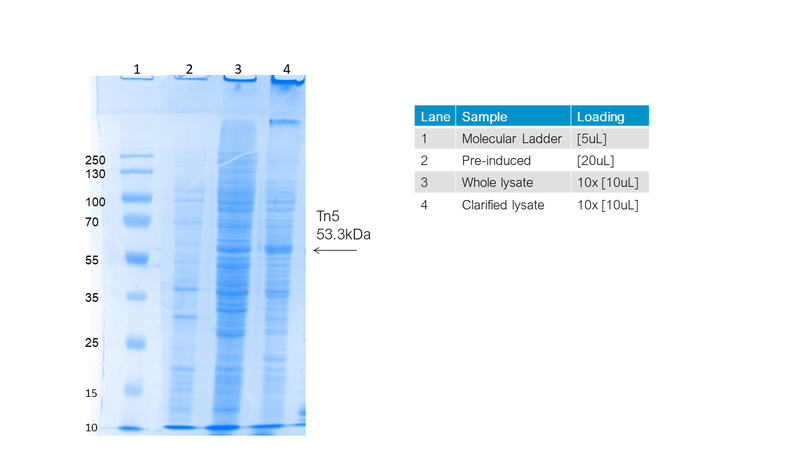 To demonstrate that the observed upper bands (figure 7, lane 4-8) are indeed the adapter within the Tn5, the same gel was stained with silver stain to track the location of the protein instead of the DNA (figure 8). The protein can be seen in lane (figure 8, 4-9), at the same location where the mobility shift of the adapter DNA was observed. This indicates that the DNA was indeed within the protein, further confirming the mobility shift. Figure 8. DNA adapter loading on Tn5 visualized on a 8% TBE native PAGE stained with silver staining. The ladder represents the size of DNA in bps. The aim of this section is to prove the ability of Tn5 to integrate the adapter sequence into target DNA (in this case EPO cDNA). The in vitro functionality was tested according to the [integration assay protocol on our wiki. To summarize our method, we incubated 2.5µM adapter with ~0 - 2.5µM fusion protein in a Tris-HCl based buffer for 1 hour at 23ºC to load the adapter on the Tn5. Next, we incubated this complex with the target DNA for 1 hour at 37ºC in the presence of Mg2+ to allow integration of adapter DNA into the target DNA ;  (table 3). Table 3. 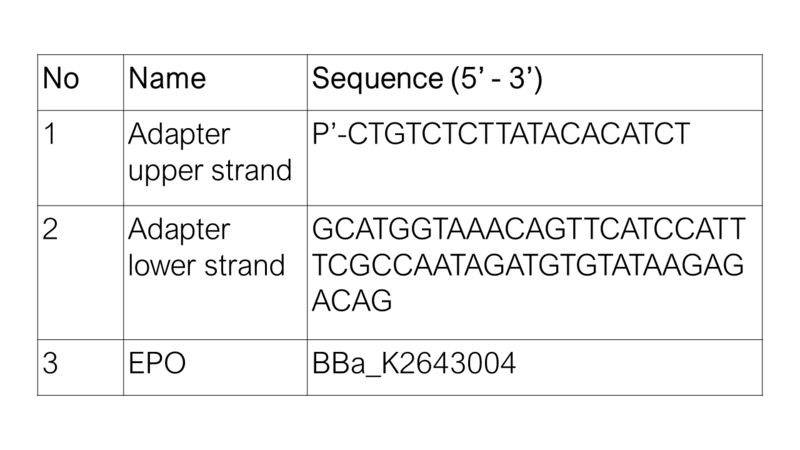 Sequence list of the adapter and the target EPO (BBa_K2643004). Note that 5’ of the upper strand of the adapter has to be phosphorylated for successful integration. The functionality assay is depicted on Figure 9. The Tn5 will be loaded with adapter DNA upon the first incubation step. Secondly, the adapter DNA will be randomly integrated into the target EPO DNA. After integration of the adapter into the target DNA, the 632bp target DNA will be split into smaller fragments. Figure 9. Experimental design of Tn5 in vitro functionality assay. 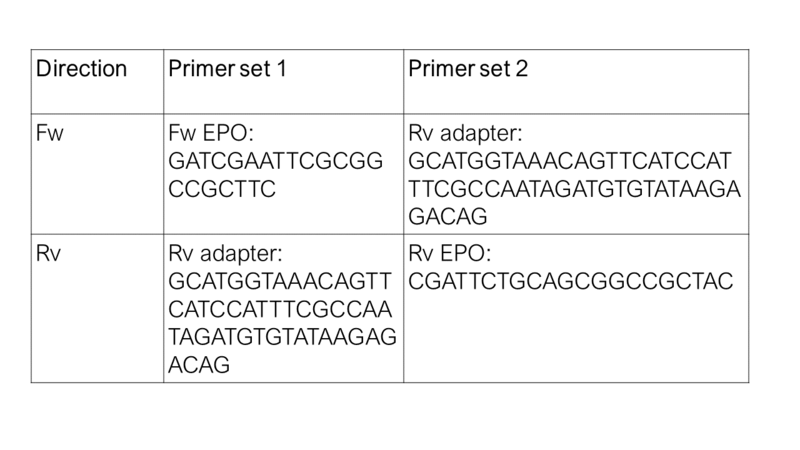 To visualize the products of the integration, PCR was performed using primer sets that bind on the ends of the EPO fragment and on the integrated adapter (table 4, figure 10). The primers sets were chosen in such a way that the location of adapter DNA integration is not influencing the analysis. The PCR step is included to obtain sufficient concentrations of DNA integration products that can be visualized. Each PCR reaction was loaded on separate lanes on 5% TBE native PAGE to visualise the amplification products. Table 4. 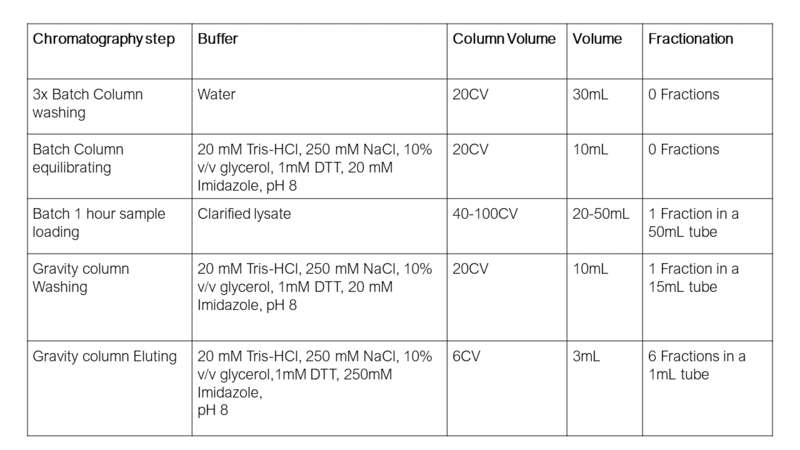 Primer lists used for the functionality assay. Figure 10. Depiction of the binding location of the primer sets 1 (left) and 2 (right) for functionality assay PCR. Figure 11 shows the amplification product of PCR with primer sets Fw EPO + Rv adapter and Rv EPO + Rv adapter visualized on 5% TBE native PAGE. The relevant lanes are shown in pink boxes. 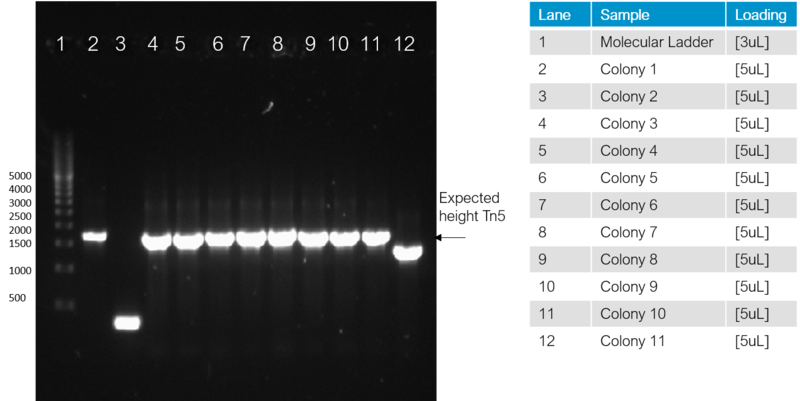 The presence of PCR amplification products, shown as smearing bands on lane 10 and 11 (figure 11) in position 50-200 bp indicates the presence of random integration products. The absence of such smear/bands on the negative control (figure 11, lane 6 and 7) confirms the integration. Figure 11. PCR products of the integration products after 1 hour integration as visualised on 5% TBE native PAGE stained with ethidium bromide. The ladder represents the size of DNA in bps. The same reaction was repeated with longer incubation times (4 hours, 8 hours, and 16 hours). The result for the 8 hours integration is shown on figure 12. In comparison with the 1 hour integration products, lighter bands representing the target DNA were visualised on lane 11 and 12 (figure 12). This indicates that a higher portion of the target DNA was split into smaller fragments due to adapter integration. More intense bands representing the integration products at position ~50 to 200 bp further confirmed this observation. The PCR products of 4 hours and 16 hours integration showed a consistent result (fainter target DNA bands and more intense integration products bands with increasing incubation time). This suggested that the activity of Tn5 is observed more and more with increasing incubation time. Figure 12. PCR products of the integration products after 8 hours integration as visualised on 5% TBE native PAGE. The ladder represents the size of DNA in bps. Our Tn5 biobrick was fully characterized, from strain construction to in vitro functionality testing. Our in vitro EMSA proved that Tn5 was able to load adapters. The functionality of Tn5 was tested by adapter integration assays. Using specific primers, PCR confirmed the adapter integration. Moreover, experiments with increasing incubation time suggested that the activity of Tn5 is observed more and more with increasing incubation time. Plasmid #60240 from Addgene, pTXB1-Tn5 from Picelli et al., was used as template for Tn5 amplification. This Biobrick contains the Tn5 transposase originating from Escherichia coli. Normally, a transposase is flanked by recognition sites called Mosaic Ends (MEs). This combination is called a transposon, which is a form of a mobile element. In this case, the Tn5 transposase is capable of recognizing these MEs, isolating the whole transposon and pasting it elsewhere. We made sure the coding sequence for the Tn5 transposase was not flanked by MEs at any time of the project to prevent uncoordinated migration of the transposon. For a similar reason, we verified the absence of genomic MEs with the genome of the host strains, to prevent uncontrollable scrambling of a host’s genome. The only sequences that contained MEs in this project were linear fragments that were supplied to a host through transformation. Using this setup, we controlled the activity of Tn5 as much as possible to ensure safe work with the Tn5 transposase in ML-1/BSL-1 laboratories. ↑ 1.0 1.1 1.2 1.3 Picelli, S., Björklund, Å. K., Reinius, B., Sagasser, S., Winberg, G., & Sandberg, R. (2014). Tn5 transposase and tagmentation procedures for massively-scaled sequencing projects. Genome research, gr-177881. ↑ Whitfield, C. R., Wardle, S. J., & Haniford, D. B. (2008). The global bacterial regulator H-NS promotes transpososome formation and transposition in the Tn5 system. Nucleic acids research, 37(2), 309-321.